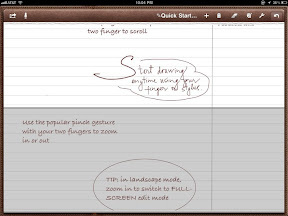 Notes Plus is the best app for note taking I have tried so far. 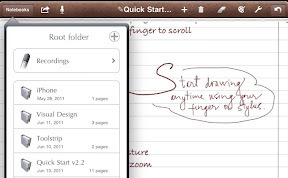 It is great for hand writing notes and for simple sketching. After trying many different apps, Notes Plus has gained the top position in my daily routine. 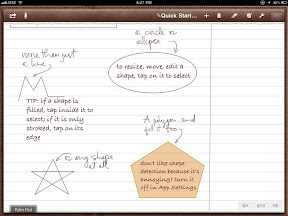 Notes Plus is very simple, yet very powerful and packed with many extremely useful features that make for a very effective note taking experience. 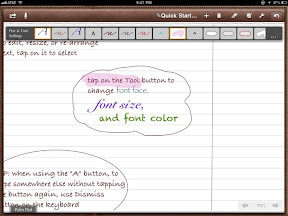 Notes plus is full of great features to help you taking beautiful and accurate notes very efficiently. My favorite features are the zoom window and the auto-advance capability. In particular, the auto-advance is brilliant even if requires a little practice to use it efficiently. 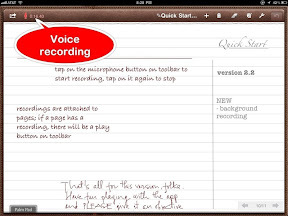 The idea is to allow you writing continuously on the same line without the need for extra taps. You can hand draw shapes, that can be recognized and translated in editable vector objects. 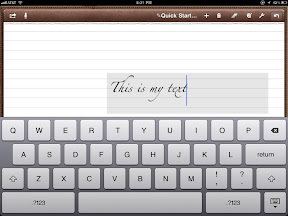 You can type with the keyboard for neat looking notes. You can customize paper type, pen color, fill, font type, size and color. You can select a portion of your note to reposition it or delete it from the page. You can use the integrated voice recorder to make sure you don't miss any important quote. 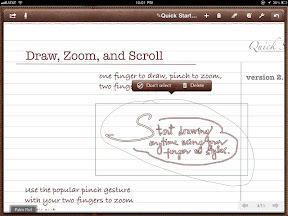 Thanks to the palm rest feature, you can comfortably use a stylus, for more accurate writing and drawing. 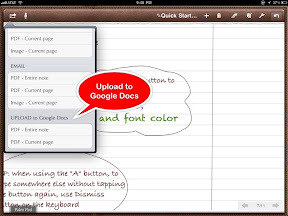 You can share your notes in different forms included Google Docs. Page scrolling is not obvious. After watching a video I learned that i could scroll vertically by swiping two fingers. That is a very essential, albeit a rather hidden feature. You may have to keep the tutorial for gestures handy. There are several hidden gestures that are essential to the effective use of the app. I really miss the ability to easily browse all my notes when working in landscape full screen. I am not quite sure why they didn't bring the fly over navigation available from the top left button in portrait view. I did switch to this app from FastFinga a month ago. Overall I am happy but there are a couple of features I miss. The first is the constrained page length. FastFinga grows your page as needed without forcing me to make a special gesture to go to the next page. This is quite annoying while writing or reading. Pages are a physical constraint when working on paper, but a completely artificial and unnecessary constraint when working with electronic media. The second is the lack of check-boxes, which were extremely handy for capturing action items and status. Sure I can simply draw a box and a check, but check-boxes allows to easily spot action items in notes and easily check them as done. This is a full overview of Notes Plus. Enjoy! You should try ZoomNotes (www.zoom-notes.com) which has an unlimited zoom feature. This means you are never constrained by 'pages'. You can also import PDF files, photographs and write on these. Are you able to do a review of DocAS 4.0?